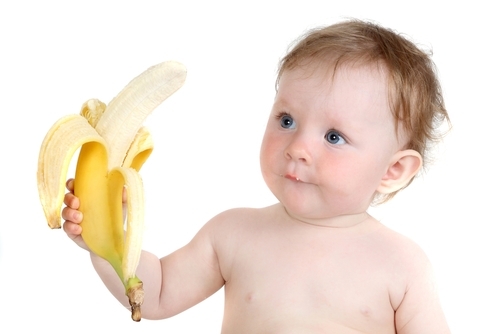 Bananas are usually the first type of food given to babies. This isn’t much of a surprise especially since bananas aren’t only tasty and sweet but contain nutrients that babies respond to. As parents begin to realize that they can actually skip the baby cereals part, introducing this fruit as their first solid food is worth it. The combination of banana’s great taste and nutrition is equivalent to happy babies and even happier parents. If you want to learn more how good bananas are for babies, read on. A banana that weighs 126 grams contains these essential nutrients as well as vitamins in the following amounts. Don’t forget that your baby will only have a small portion of these vitamins and minerals especially when they’re just starting to eat solid foods. According to the American Academy of Pediatrics, parents should wait until their baby is at 4 to 6 months old before introducing any solids. Aside from this, other health group suggest to wait until closer to the end of the sixth month of the baby before letting them eat solids. You can ask your paediatrician when the best time to start your baby with solid foods is. They’ll be in a much better position to tell you based on their findings. Go for bananas that are yellow to yellow-green in color and with few black spots. The fruit will be ready for your baby’s consumption once all the greens disappear and that the fruit is easy to remove from the stem. To store bananas, make sure that they are in their jackets and at room temperature. Don’t put them in your refrigerator. After you’ve pureed the fruit, you can then store it in the fridge. Take note, however, that bananas can turn brown once you prepare them. Don’t worry. It’s still good for your baby to eat.